Purely Northwest’s Antifungal Soap with Tea Tree Oil is a truly versatile product. It’s enriched with nourishing botanicals and essential oils to ward off bacteria while soothing dry, flaky skin. Choose the Medicated Lotion Soap by Provon for a highly anti-microbial soap. The formula is safe to be used on your piercings and is trusted by the Association of Professional Piercers. 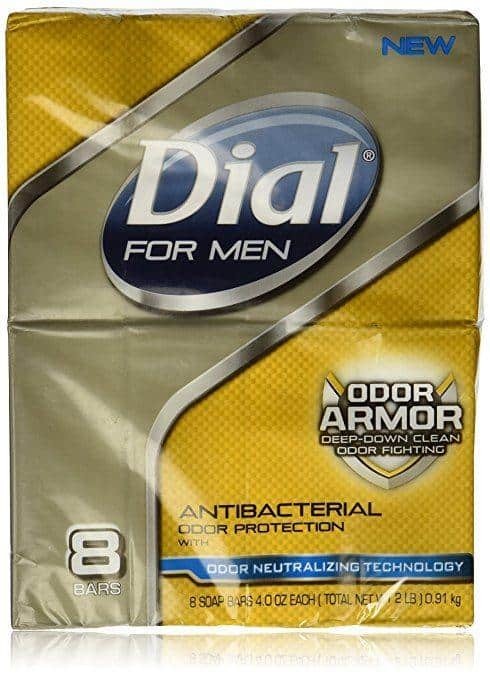 The Odor Armor Antibacterial Soap by Dial for Men boasts of its odor neutralizing technology for odor protection to last the whole day. It has a fresh and clean scent that’s not too overpowering. Go for the Antibacterial Oregano Soap by Aromavita for a natural product that’s high in antiviral, antibacterial, and antibiotic properties. It can be used to treat several nail and skin conditions. The Pure Castile Bar Soap by Dr. Bronner’s caps off this list. This medicinal bar soap is also infused with pure Tea Tree Oil which makes it ideal for dandruff and skin that’s prone to acne. Need help choosing the best antibacterial soap and body wash? Read this article and discover what experts have to say. Germs are literally everywhere. They are on your phone, keyboard, doorknob and all surfaces you can think of. Now, imagine your hands touching those bacteria? Gross, I know. But that’s not the real issue. You see, as much as 80% of infectious diseases can be transferred by hands. This means that if you don’t wash your hands properly, you’re practically putting your health at risk. By now, you’re probably wondering: How should I wash my hands then? Let’s start off with choosing the best soap. Even if a soap claims to be antibacterial, you shouldn’t believe it right off the bat. You have to really pay attention to its ingredients to know if it can actually work. And to know how safe the soap is for your skin. There are ingredients in antibacterial soaps that can do more harm than good. Just take a look at the list below. Parabens are added to skincare products and soaps to make them last longer. You can think of them as preservatives. While they are helpful in extending your soap’s shelf-life, parabens are notorious for disrupting your hormones’ balance. They can strongly mimic the function of estrogen, a female hormone in the body, which encourages the formation of tumors in the breast. Synthetic fragrances contain phthalates, another hormone disruptor that can also cause an alteration in genital development. In addition to that, fragrance can cause allergic reactions and skin irritations. They are frequently added to products to attract you and to mask any unpleasant smell those products have. Dyes are used in products for only one purpose and that’s to get your attention. And while they can make your soaps look pretty, they won’t spell the same news for your skin. Dyes can cause skin irritations. In addition to that, they can also cause cancer. DEA is what makes your soaps and body washes cream and sudsy. Although they are a great help in creating that rich lather, this ingredient is closely linked to the development of allergies and organ system toxicity. Here’s a closer look at our top picks as the best antibacterial soaps and body washes. A lot of soaps formulated to fight bacteria can leave the skin dry and dehydrated, but this Antifungal Soap with Tea Tree Oil won’t. Packed with Aloe Vera and other skin conditioning agents, it will leave your skin feeling healthy and soft. It has a concentrated formula which means you’ll get all the benefits it promises. And what exactly are those benefits? Well, let me go through them. For one, it has tea tree oil. This ingredient is a potent antibacterial agent. Its effects are comparable to benzoyl peroxide, a widely used ingredient in treating acne. So, if you have zits on your body, this soap can surely help you get rid of them. And you know what else? Apart from zits, you can also rely on tea tree oil in treating athlete’s foot, nail fungus and body odor. Now, if you are a gym buff, this product is something you shouldn’t really miss. With all the germs and fungi lurking in the gym, you’ll definitely need something to protect your skin. And if you have inflamed skin, you’ll benefit from this product, too. It’s formulated with aloe vera, vitamins A, B, C, D and E to soothe and condition your skin. Another thing that will surely make you fall in love with this soap is that it’s free from parabens, dyes and synthetic fragrances. Antibacterial soaps aren’t only important in preventing the transmission of diseases; they are also a great help in making sure that your wounds- whether it’s from an injury or a procedure- don’t get infected. This is the exact reason why this Medicated Lotion Soap by Provon made it to this list. Trusted by the Association of Professional Piercers, this soap guarantees that your piercings won’t get infected in any way. Well, apart from that it’s backed by trusted professionals, the product actually has a very effective formula. It has 0.3% chloroxylenol which is both an antiseptic and disinfectant. And if you worry about your skin getting dry, the soap has skin conditioners that ensure that your skin doesn’t end up that way. The product has a pleasant and clean smell that is nowhere near perfume-y or medicinal. It also doesn’t foam up like traditional soaps but it doesn’t mean that it’s not working. It actually works fast. For example, if you use regular cleaning treatments for a piercing infection, it will normally take a month or so to heal. But with this cleanser, it’ll only take two days. We repeat: two days. Now, you’re probably wondering, it this just for piercings? The answer is no. You can actually use it as a hand soap, too. Body odor is not something you can easily hide. Unless you eliminate its root cause, you’ll continue to stink- no matter what perfume you use or how frequent you shower. One of the most common causes involves bacteria. When those bacteria thriving on your skin break down your sweat into certain acids, your body will start giving off an unpleasant smell. That is exactly where this Odor Armor Antibacterial Soap fits. It has this ability to fight bacteria while removing dirt and oil that can attract germs. In addition to that, it’s also formulated with odor neutralizing technology to leave your body smelling clean and fresh. Now, that feature is both a good and bad thing. It’s good since it can help mask and eliminate your body odor. It’s bad thing if you have extremely sensitive skin or you’re allergic to fragrance. This bar soap isn’t the prettiest one out there. It has a black, almost greyish color but it lathers up well and effectively does its job—and that’s what’s important, right? For a bar soap, this Antibacterial Oregano Soap offers a lot of benefits. And I’m not even kidding. Formulated with 3% oregano oil, this product can help treat a number of skin issues. You can use it to get rid of acne and even Malassezia, thanks to its extra strength antibacterial properties. And you know what else makes this soap extra special? It contains 100% natural ingredients. You won’t have to worry about any harsh chemicals that can compromise your skin. Apart from that, the product creates a really nice and rich lather which is perfect for cleansing your skin and getting rid of any dirt and oil. Now, here’s a small concern. Because the product has oregano oil, you may feel a bit of tingling sensation as you use it. It’s not really that bothering, unless you have really sensitive skin. To get the soap’s full benefits, make sure to leave it on your skin for around 2 to 5 minutes before rinsing off. Remember to consider your skin’s tolerance and avoid the maximum time if your skin is highly reactive. If you are looking for something that’s safe for your skin, this Pure Castile Bar Soap is something we can highly recommend. In addition to its natural ingredients, its packaging is also eco-friendly. It’s made from recycled materials which can add to your peace of mind. Now, what makes this great against bacteria? Similar to our best antibacterial soap, this product has tea tree oil, too. By now, you probably have a good idea on how potent it is in killing bacteria. Apart from tea tree oil, this soap also contains hemp oil to make sure your skin doesn’t end up severely dehydrated and dry. The soap has a woodsy smell and produces a good amount of lather. It also doesn’t create any burning sensation which is are two great things for those with sensitive skin. Well, since it’s in bar form, it melts away quickly. With so many antibacterial soaps available, it’s a bit hard to believe that most of them don’t work. It’s a bit intimidating, too. Like, what if you choose the wrong one? Or what if you end up with more health problems? This is why it’s really important to pay attention to what a product contains. Don’t believe companies and what they claim without doing proper research first. Antifungal Soap with Tea Tree Oil by Purely Northwest is our best antibacterial soap. Formulated with tea tree oil, it offers a strong line of defense against common skin conditions. It can help you with your acne, nail fungus, jock itch and so much more. And since it has a concentrated formula and natural ingredients, you can use it for everyday protection without having to worry about any nasty side effect.